VERO BEACH, FLORIDA - File it under “Even a blind squirrel finds an acorn once in a while,” if you must. Sure enough, the brittle Romo went down yet again, this time in the preseason. 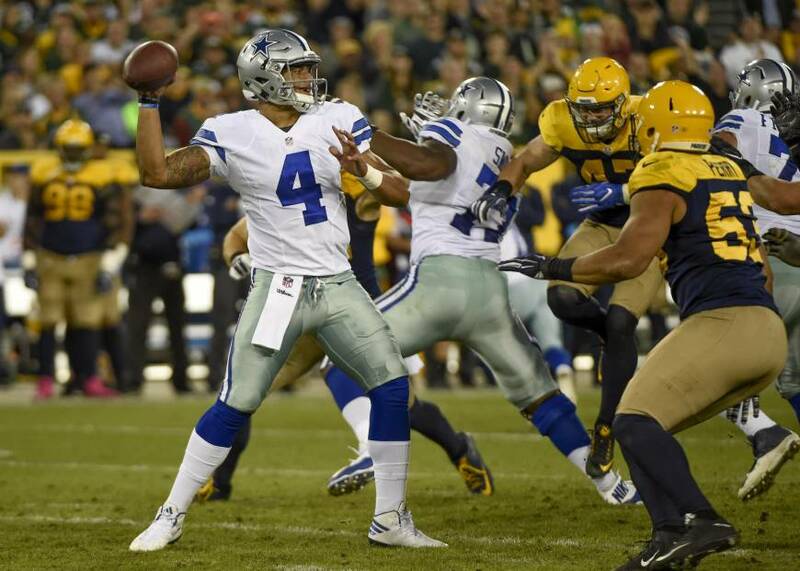 Prescott then proceeded to fill the breach remarkably well and make MAS a squirrely seer as he led the ‘Boys to the NFC’s best regular-season record in 2016. MAS had seen Prescott from field level at a Mississippi State contest during an SEC football pilgrimage he made several years back. 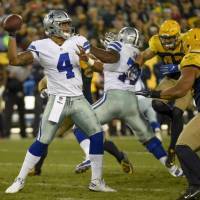 He knew then that Prescott had the NFL QB goods — rangy, extremely mobile, strong arm, heady leader. Prescott surprised many folks — but not MAS. Feeling his oats (pressing his luck?) MAS today offers his two cents on the QBs drafted in the early rounds this year — and the possibility of a Dak redux. Not surprisingly, most of the quarterbacks selected in the first two rounds are similar to Prescott in modus operandi. Only North Carolina’s Mitch Trubisky, chosen by Chicago with the draft’s second overall pick, doesn’t fall into the Dak department. Trubisky lacks Prescott’s maneuverability but makes up for it in the area of aerial accuracy. A pure pocket passer, Mitch connected on 68 percent of his throws last season for the Tar Heels. Style-wise, Trubisky is more like Philadelphia’s Carson Wentz. He is still athletic enough to move about in the pocket and scramble when need be. If not the next Dak, he could become a very solid conventional NFL drop back passer. Now, onto the hoped-for (by the clubs and their fans) Prescott clones. Clemson’s Deshaun Watson, lauded by many as the best all-around quarterback available, was selected by Houston with the 12th pick overall. The Texans, for the last three seasons, have been great defensively (see JJ Watt and Jadeveon Clowney) but struggled mightily on offense — mainly due to mediocre-at-best QB play. The Texans had tried to fill their gaping hole at that position by paying a king’s ransom in free agency for Brock Osweiler, Peyton Manning’s backup in Denver. You may recall MAS calling it an unwise move at the time, since Osweiler, in MAS’ opinion, was an unproven and questionable talent. No shocker, then, that Brock bombed last season in Houston. Yet the Texans were somehow able to shunt their problem off on Cleveland, who accepted Osweiler in a trade. The Texans feel Watson has Prescott savior potential. Ummm, not so fast, pod’nahs. Make no mistake, Watson was a terrific do-it-all college quarterback in leading Clemson to back-to-back national title games and a championship last season. Sorry, but MAS does not see Watson as Prescott 2.0. He just doesn’t have the pocket presence that Dak did. And the arm strength is not quite the same either. The best Houston can hope for is a reasonable facsimile of Seattle’s Russell Wilson, which is certainly not a bad thing. Next up, the third field general drafted in the first round: Patrick Mahomes II out of Texas Tech, chosen by Kansas City with the 10th pick. Pat I’s boy — for better or worse — has been stuck with the label “Gunslinger” — as in wild and wooly risk-taker (think Brett Favre here). Mahomes IS mercurial. Skillful one play, out-of-control the next. K.C. coach Andy Reid probably sees a lot of Donovan McNabb (his QB with Philadelphia) in Mahomes. Reid hopes to work his QB guru magic to similarly harness Mahomes’ talents so his Chiefs can make it past the second round of the playoffs for a change. MAS doesn’t see it happening anytime soon, if at all. Now onto the final Dak hopeful: Notre Dame’s DeShone Kizer, plucked by Cleveland in the second round. In Kizer, MAS sees the real possibility of the Prescott scenario replicating itself in 2017. Both the player and the circumstances are right. As a redshirt frosh, Kizer passed and ran the Fighting Irish to national contender status in ’15. But he then struggled last campaign while the Irish sputtered to a disastrous — by Notre Dame standards — losing record. MAS felt for Kizer. He was still the same player, he just didn’t have the necessary help around him. That didn’t stop ND’s fickle coach Brian Kelly from nagging Kizer non-stop and indirectly blaming him for the Irish’s woes. Kizer, to MAS’ eyes, is still the complete package. Same Prescott size and skill set. He was smart to leave early for the NFL. But Kizer is not QUITE ready to pull a Dak redux, should he be called on at the outset of this season by Cleveland, a la Prescott in Dallas. Hopefully, the Browns will first try to resurrect the career of Osweiler while also giving ex-USC draftee Cody Kessler another shot. Let them flounder. What’s a little more Browns futility at this point? That will give Kizer the time needed to polish his considerable talents to the point he is NFL starter-ready. Then, if (when?) his shot comes this upcoming season, DeShone Kizer should be ready to explode on the pro scene just like you-know-who did with the Cowboys. And prove to be the acorn meandering MAS tripped over THIS year.